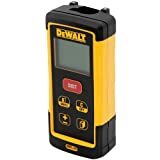 Dewalt DW03050 165-Feet Laser Distance Measurer, is a laser tape measure tool manufactured and designed by Dewalt industry. It’s a durable yet simple measuring tool that measures distance and calculates area and volume. It measures up to 165ft (plus or minus) with an accuracy of 1.5 millimeters. This laser measure has the ability to records and store up to five measurements continuously making it efficient. The Dewalt DW03050 165-Feet Laser Distance, measures distance using its class 2 laser. It is able to automatically calculate area and volume using the measured distance. With an accuracy of 1.5 millimeters, its estimates are accurate and reliable. It’s automatic calculations makes it easy and efficient to calculate measurements. The Dewalt DW03050 can measure indirect height measurements. The laser measurer uses Pythagoras to measure indirect heights. Even if the two indirect points are not in a linear measurement, with the Dewalt DW03050 the distance between the two points can be measured. This feature makes it applicable to perform complex geometric operations. The Dewalt DW03050 has an in-built memory unit. This memory units enables the measure to store up to 5 measurements. This gives saves time as you won’t have to stop after one measurement and record. This feature makes it time efficient while using and as we know time is money. The Dewalt DW03050 165-Feet Laser Distance Measurer in both dim and very bright condition easily. Its enabled by a 2-line back-line display as the screen. The 2-line back-line display ensures screen visibility. This makes the records on the screen easily readable reducing errors and strain when taking down measurement. Dewalt DW03050 has an over-molded casing which protects it from easily getting damaged. It’s tested to withstand up to a 6 ft fall. The over-molded housing also prevents water from penetrating into the measure making it safe to use when raining. This feature increases its life-span making it durable. Does the Dewalt DW03050 165-Feet Laser Distance Measurer has a warranty ? if yes how long? The laser measure comes with a 3 years limited package and a 2 year contract of free service. What is packaged in the Dewalt DW03050 165-Feet Laser Distance Measurer box? DW03050 laser measurer A protective pouch with a belt loop AAA batteries A user manual. The Dewalt DW03050 165-Feet Laser measurer is a convenient tool to use for surveying, construction and civil engineering fields. It has a good reputation as it has all the features required in those fields and gives accurate results . It’s affordable and durable and i would definitely recommend it to a friend.